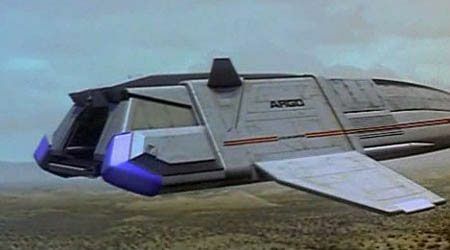 Notes: The Argo is a specialized shuttlecraft developed by the crew of the Enterprise-E for ferrying cargo and vehicles between orbit and planetary surfaces when conditions preclude the use of transporters. The design is fairly conventional, though the nacelles are more integrated with the body than is usually the norm for Federation shuttles. The Argo has been designed with a range of vehicles. Most prominent amongs these is a wheeled recreational / general purpose vehicle designed to enable away teams to cover larger areas of ground than they would otherwise be able to. The vehicle is fitted with a phaser cannon to provide a limited defensive capability.